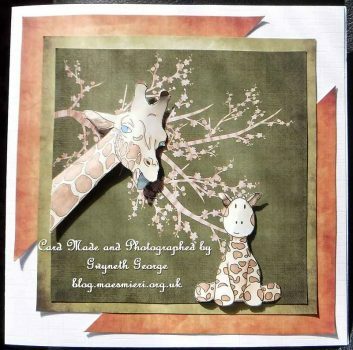 Hand crafted items made by Gwyneth – Please read "About Me! – Gwyneth"
I know that I write a lot in each blog post – this helps me remember what colours or cardstock I’ve used in case I want to get a similar effect in the future, in addition to providing information that some readers might be interested in – so please don’t think that you have to read every word I’ve written. If you don’t want to read my musings, or know what I used and how I made a card you can just click the thumbnail images to view each card at a larger size, and then click “Back” and scroll down to the next section. Thank you for clicking over to have a look at my blog. It’s time for me to show you another DT card as today we see the start of a new challenge on the “Dragons Lair Designs Challenge Blog“. 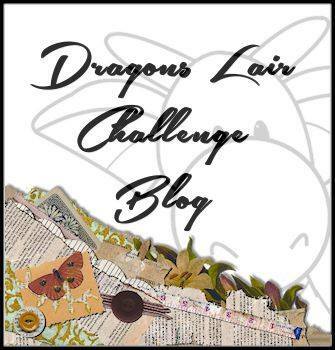 Each ”Dragons Lair Designs Challenge” goes live the first Friday of the month with a new theme each time. The winner will get picked by “Random” so that it is fair for all levels of crafters. The winner gets a prize, as well as a badge for their blog, and the winning entry will also be highlighted on the challenge blog the following month. Although we’d love to see Dragons Lair Designs items on your creation, you may ENTER the challenge using ANY MATERIAL you wish as long as you clearly follow the set theme. You may enter the challenge with ONE entry per month. So why not consider joining in with us this month – go to the challenge blog and have a look at the rules and the inspiration created by my fellow Design Team members. The theme for July is “It’s a Zoo Out There!” Your creation doesn’t have to have a zoo on it – anything animal, or even a bird, you might see in a zoo, or in fact any animal at all, will be great. We want to see your take on the theme. Please join in and let us see your crafted creation. I’ve gone for a card this time as my inspiration for this challenge. I couldn’t resist the Baby Giraffe digi-stamp to play with and chose other items from the DLD online store to go with it. Ultra tacky red backed tape. I scored one sheet of cardstock and trimmed the other to make my base card by attaching them together using ultra tacky tape. 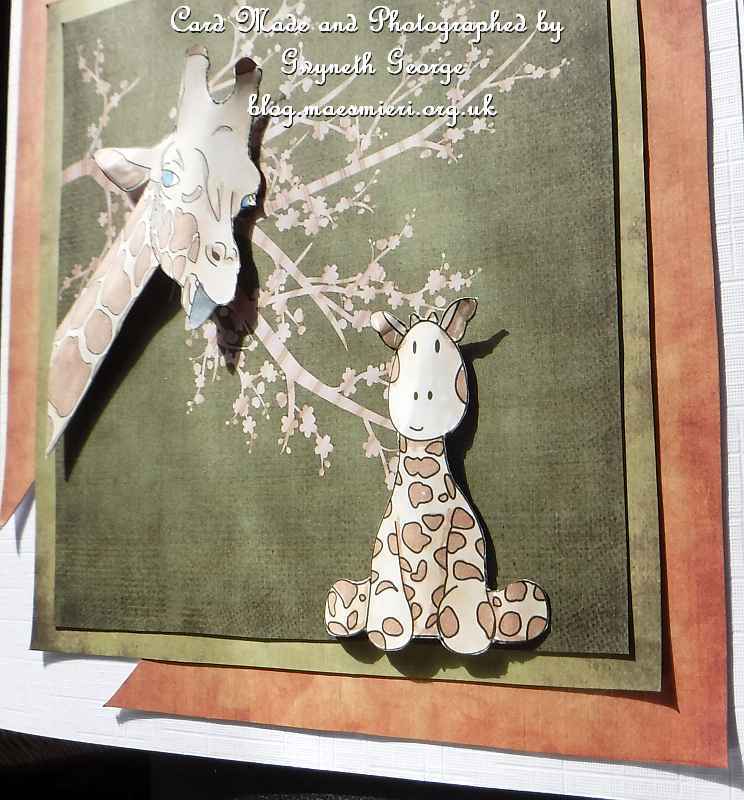 I took several items from the papers collection, as well as both digi stamps, into the My Craft Studio software. I played around with the sizes of the items until I was happy with the proportions and used a digital die cut function in the software to cut kits of branches from one stripy background that I placed at different angles on a green background. Once I was happy with everything I printed out the digi stamps, the background with branches, and a couple of other background paper Designs and cut them all out. I cut one of the backgrounds diagonally across as well. I then used the roller tape pen to attach the backgrounds in place. 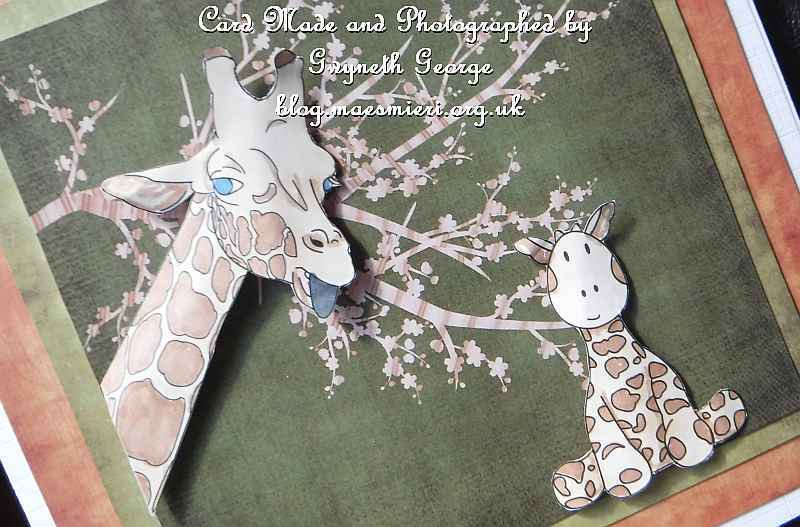 I coloured in the two digi stamps, cut them out and shaped them, before attaching them to the card front with glue gel. Here are a few more, angled, photos of my card – getting closer and closer. 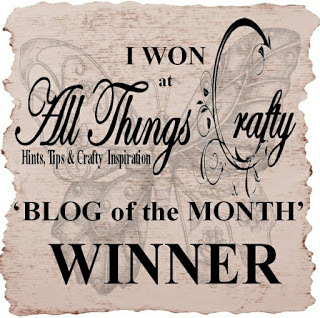 Please go over to the “Dragons Lair Designs Challenge Blog” and have a look at my fellow Design Team members’ inspiration pieces and to enter your creations. I can’t wait to start visiting your blogs to see. 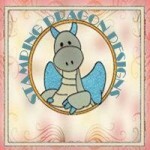 If you fancy trying out some of Dragons Lair Designs, please do visit the Store to find all sorts of digital goodies for crafting, and the minimum spend is only £2 (you’ll find great digi-stamps and lots more). And why not join the “Dragons Lair Designs Fan Group” on Facebook. It’s a small, fun, group where we have lots of different activities which include exclusive challenges, daily inspiration and giveaways – and there’s a loyalty club for those who take part as well where taking part gets you points, winning gets you more points, and get enough points and you get a voucher to spend in the shop. We have a page on Facebook. If you like the creations I’ve made using Dragons Lair Designs digital downloads then we’d love it if you popped over and “Like” us. While I’m not a fan of Pinterest and especially people’s habit of posting images, digi-stamps, etc., to the site that they’ve got no rights to, you can follow designer Janette Padley on Pinterest! You can see my page on Facebook by clicking – here. 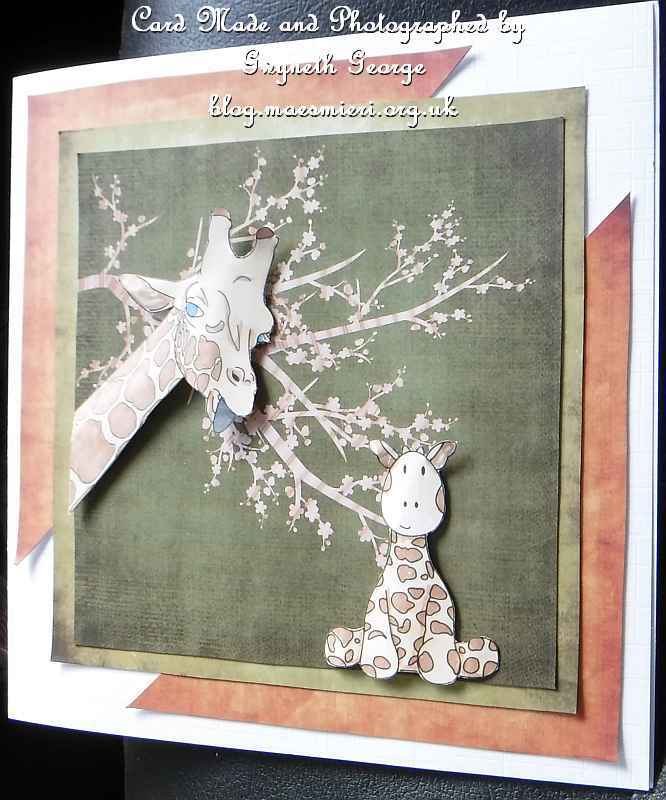 What an ingenious design, love the giraffe popping into the picture and the cute baby too. This means that you can bookmark the page in your browser, or follow with services such as Bloglovin', but you can't copy images to your computer or anywhere else, and that includes not pinning to Pintrest. I hope that you are inspired to craft similar things yourself, not to copy completely, and to help you I include item titles, creators and links for stuff I've used in my creations..